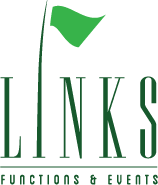 Open daily, Links Café offers a delightful space overlooking the golf course for a social catch up with friends, a special lunch or just a delicious snack from the cabinet or hot coffee to take out with you on the fairways. The menu will change regularly with a focus on wholesome quality ingredients and the cabinet will offer lighter, quicker options. With so much onsite parking, free Wi-Fi and stunning scenery, Links Café is the perfect setting to enjoy your day. We look forward to welcoming you. The café is open to both members and casual guests. Call 03 385 0904 to book a table. Beautiful views of the golf course are the backdrop to the Links Restaurant. Currently the restaurant is only open for our themed restaurant nights or private bookings by request. Our executive chef presents an exquisite menu using the freshest of ingredients and locally sourced produce. The restaurant features an extensive wine and beverage list. Dining takes place in our elegant modern dining room with crisp white linen and soft candlelight to enhance this already special location or for a more intimate setting of upto 12 guests you can choose to hire the Beautiful Charles Gallery. Our chefs can accommodate individual dietary needs on request. Please just ask our friendly staff for assistance if you require anything.